As fun as extensions and wigs can be, after a while, it’s nice to give your natural hair a break and let it shine in a way that protects its health. Many women shy away from this option because they believe their options are limited. However, after researching different styles you can incorporate into your gorgeous natural hair, we’ve come up with a whopping number of different short natural hairstyles that you’ll love. Whether you’re growing your hair out, giving it a break from weaves, or just in the mood to try something new, trying a short natural hair look can be a great change to make. No longer will you feel tied down to the simple short haircut — rather, you might be overwhelmed by all the available options you can choose from! Follow along as we round up the fiercest short natural hairstyles out there, and get ready to be inspired to go natural, too! Remember Lupita Nyong’o’s gorgeous look in Black Panther? 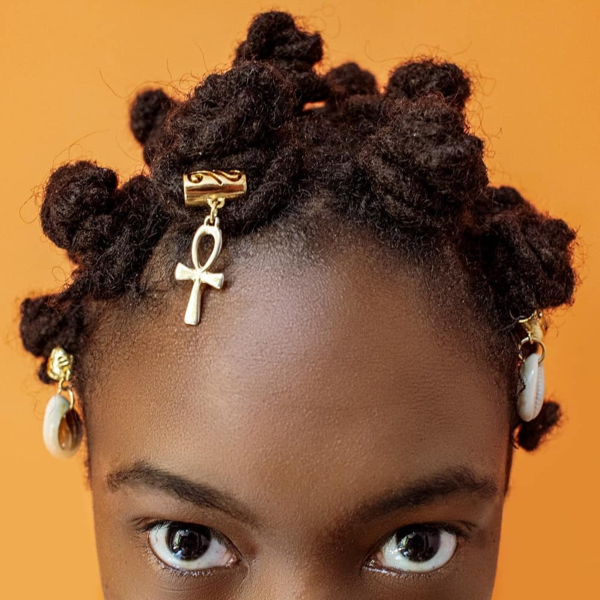 This stylish look is called Bantu knots. These small knots are considerably easy to create — just keep in mind that the shorter the hair is, the smaller the knots will need to be. On the other hand, if you’re craving larger knots you can always use extensions. 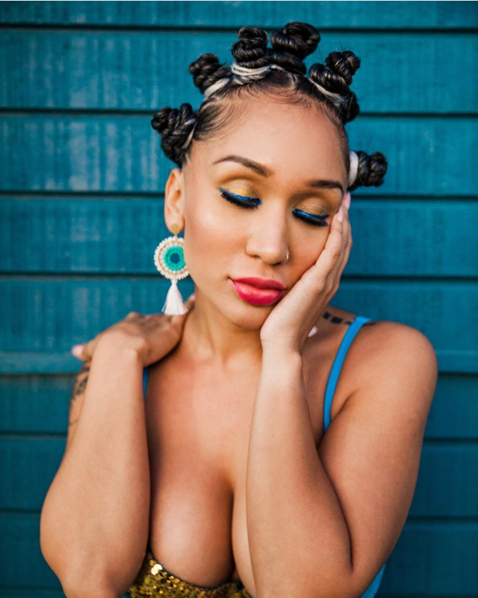 This defeats the purpose of a natural hairstyle for short hair, but we won’t tell anyone! It’s easy to find tutorials online for how to create this look, so just run a quick search on YouTube for directions on how you can do this at home! A faux-hawk is a fun hairstyle that doesn’t necessarily require hair to be as long as you might think. It’s also super easy to rock on a special occasion or to keep it going for a seasonal look! To master the faux-hawk on natural hair, all you need is a few bobby pins, smoothing cream, and a fine-toothed comb. You’re essentially going to make horizontal sections of your hair and secure all of the hair from each section in a vertical line down the middle of the back of your head. Start by gathering hair from a small section at the very back of your neck. Comb it towards the middle, smooth edges, and secure with an elastic or pin. Continue this process on each section, smoothing down and securing the last section of hair above. Once it’s all secured into the faux-hawk, separate your curls to create more volume and fill in any open spaces. Now you’re ready to rock the ‘hawk! A twist-out look includes tiny twists that create a unique texture. The best part about this style is that it’s one of the best-looking natural hairstyles for short hair, as you don’t need length to get the beautiful texture. To achieve this short twist-out look, begin by preparing with a detangler or a combination of water and oil. Then, seal in the moisture with a curl cream. Section it off into small sections (or choose size based on your preference). Create twists by wrapping your hair around itself in two parts from roots to end. If your ends don’t curl, you can add perming rods. But for this short look, that’s not usually necessary. Continue the twisting process until your whole head is done. Let it sit and then begin unwinding the curls with a hair pick to get the volume you’re looking for. Many women love finger waves but are scared off by assuming it’s just for straightened hair. You can still get this look on short, natural hair with just a few simple tricks. First, begin with damp hair that’s been freshly washed. Apply a thick leave-in conditioner for added moisture. You want your hair to remain damp/hydrated during the whole process, so be prepared to spray your hair with water if it begins to dry. Next, get ready to style with firm hold gel and a fine-toothed comb. Part how you like it, and begin by carefully molding your waves with the comb in a finger wave pattern. Perform the same routine to the other side of the part. You may want to have a friend help you with the back side, or you can use a mirror to help! Seal the style down with hairspray after covering it in a scarf and completely drying it. A simple side part is a great way to take the easiest short hairstyles for black women and make it stylish. This look is great with a tapered cut, but it can look great on any length or style of short hair. We recommend asking for tapered 4B or 4C hair to start out. Ask your hairstylist to add in a side part wherever you’d like. You can ask for a subtle part, or a sharp, deep part that stands out. Looking for more ways to make this look fun? You could pair it with a bright color to really get an edge. If you’ve got a TWA but you’re looking to switch up the look, try creating a mini puff in your hair! To achieve this look, you want to gel back your hair as tight and flat as you can. This will allow you to use the ends of your natural hair for the puff. If your hair is still too short to get much of a puff going, it’s easy to clip it back and add a clip-in puff to complete the look while still maintaining your natural hair. Last on our list is the Flat Twists look. This is a great protective style for even the shortest of hair. One great thing about flat twists is that you can add complex flair to them or keep it simple. If these steps sounds confusing, you might find better luck checking out a video tutorial that will show you step by step! With all of these options, there’s no excuse not to rock your natural texture!